The greatest time of the year is finally here for college hockey fans, conference playoffs and the NCAAs. This year playoffs results, like past years, will have big implications in the Pairwise Rankings and NCAA playoffs seedings. Thankfully for Bulldogs fans UMD is a near lock to make the NCAAs. 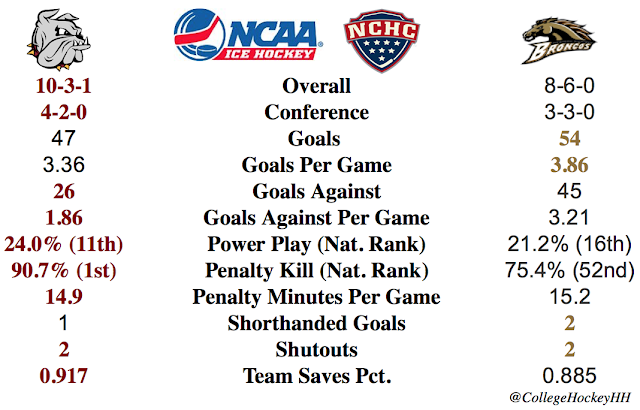 The NCHC first round playoff matchups are very good and I think they will be some upsets. From top to bottom the conference is so close that any team could step up and make a run. I particularly like Colorado College and Nebraska Omaha as potential first round upsets. The Mavericks power play is so potent that if they get hot they could easily propel them for a trip to St. Paul. Like wise, the Tigers have developed some high ends players who if matched with some good defense and goal tending also have what it takes to get the upset. It should be some great hockey over St. Patrick's weekend in St. Paul. #RV Western Michigan @ #8 Minnesota Duluth: The last time they played a couple weeks ago UMD won the two games with a combined score of 14-1. It will be different this weekend as the Broncos are healthier, but they won't be able to win two games at Amsoil. UMD wins in 3 games. Miami @ #1 St. Cloud State: The Huskies have played like a #1 team recently and the Redhawks won't be able to change that, the Huskies sweep. 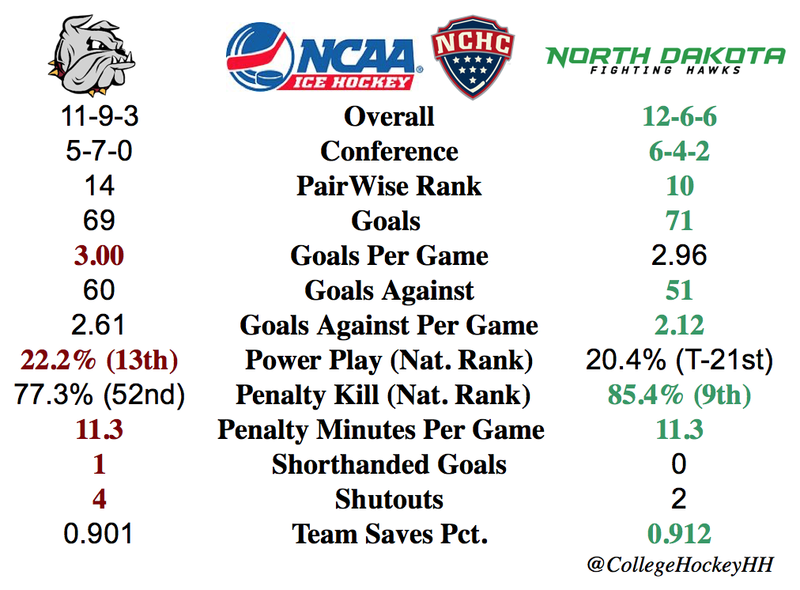 #13 Nebraska Omaha @ #14 North Dakota: Both the Fighting Hawks and the Mavericks are playing for an NCAA birth, winner likely goes and loser is done. I like the PP for the Mavericks to carry them to a playoff birth in three games even with their poor road record. 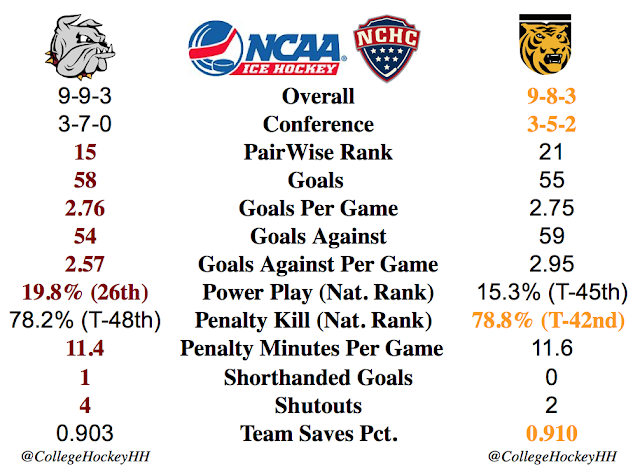 Colorado College @ #4 Denver: This years matchup is much closer than last years for these teams. My gut says the Tigers get the upset in three games, so I am going with it. The NCHC 2017-2018 season has flown by once again as the Bulldogs are hosting Nebraska Omaha for the final weekend series. If UMD is able to get one point they will clinch the third place position in the NCHC regular season standings after last weekend securing home ice for the playoffs. The excellent play since Christmas has put this team as an almost sure thing for the NCAA tournament. In my opinion this is quite an accomplishment. Coming into the season with UMD down 10 players from last years NCAA runner-up team there were so many question marks that my expectations were set low since the NCHC is such a strong conference. This year the Bulldogs have shown they can beat tough teams and can win a bunch of games in a row and steal some games that they probably should have lost which makes for new expectations of a team that can be a real factor in the NCAA tournament. The players that returned from last year know the pressure they will face hopefully will be able to show the youngsters how to handle this pressure. There are several bright spots with this young team first with goal tending and the second with the defense. The biggest question mark coming in was who would be heir apparent to Hunter Miska which has been answered by Hunter Shepard who has six shutouts on the season to his credit and the season isn't done yet. On defense, returning one starter usually is enough to cause heart palpitations, but this group of youngsters have stepped up and played fantastic. So good in fact, that everyone hopes they will wear the UMD sweater for several seasons and not be done after one or two. The future looks good. 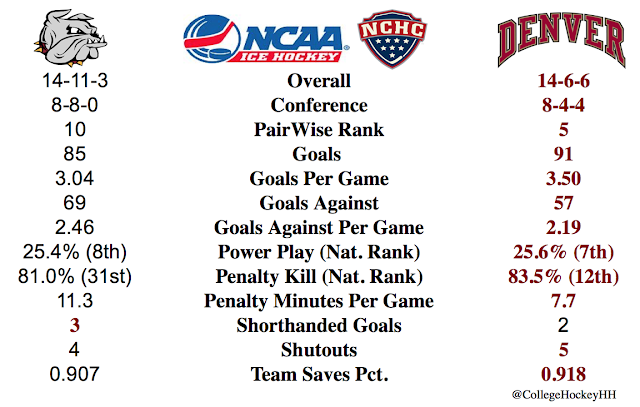 As for the final two games of the season, UMD is in a good spot. The Bulldogs seem to match up well with the Mavericks. Back in December they split with the Mavericks scoring 11 goals in the two games in Omaha but did give up 9 goals. This shows that Mavericks are a good team that can score a lot of goals but have have struggled to score at times as well. The Mavericks have had scoring outputs of one game of 11 goals, two games with 7 goals and three games with 6 goals, but like the Bulldogs they have been shutout on six occasions this season as well. Staying out of the penalty box will be very important for UMD if they want to keep the scoring low for the Mavericks. 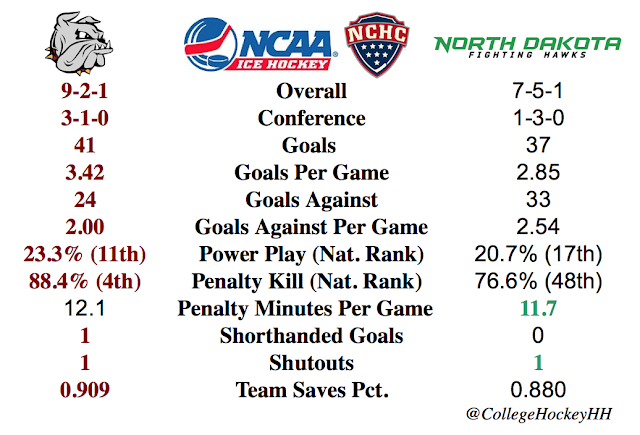 Nebraska Omaha @ Minnesota Duluth: I like the way UMD has played on defense the last few weeks and they will continue this and pull out a sweep. St. Cloud @ North Dakota: The Fighting Hawks have struggled recently but should be helped by facing a rival that clinched the Julie and Spencer Penrose Memorial Cup. My gut say major let down by the Huskies but I can't say a sweep by the Fighting Hawks, so it will be a split. Miami @ Denver: These team split early in the year, but Miami hasn't been great on the road this year. Denver sweep. Western Michigan @ Colorado College: Two big games for these teams. If the Broncos play like last weekend they will have a long trip back to Kalamazoo. The Tigers will sweep.